On 4 June 2015, Habitat for Humanity distributed 72 temporary shelter kits in the community of Bhetwalthok, Panchkal municipality, Kavre district in Nepal. Habitat staff and volunteers also built a demonstration temporary shelter to train local community members on how to use the kit. Habitat hopes to distribute 2,000 temporary shelter kits and build five permanent homes by the end of June 2015, with more homes to follow. The following story (4 June 2015) was told to Habitat for Humanity Asia Pacific communications coordinator Angeli Alba. 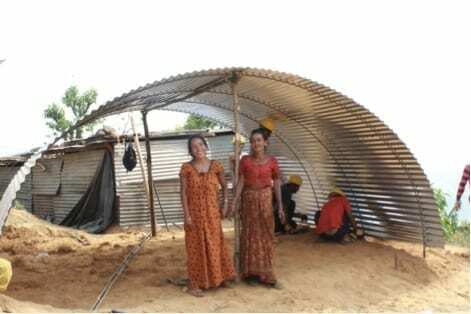 Savitri, with her sister-in-law, stands in front of the temporary shelter that Habitat for Humanity volunteers and local community members are helping build for her in Bhetwalthok, Panchkal municipality, Kavre. Photo by Habitat for Humanity Nepal/Amy Deuja. Savitri, 35, has been raising her four children alone since her husband passed away 10 months ago. When the magnitude-7.8 earthquake hit Nepal on 25 April, she and her children were in a house in Kathmandu. Her first concern was how to save her kids – ranging from three to 17 years old. Savitri and her children all ran out into an open space in the city, then had to spend the next two nights without shelter. “It rained, and my kids were drenched those two nights. But what else could I have done, with no place to take them?” she said. They continued to stay in the open until she approached a neighbor to ask if Savitri’s family could share a tent with his family. He generously agreed. When another earthquake hit Nepal on 12 May, all that Savitri could think of was, “This is it. This is the end. I thought my kids and I are all going to die here and now.” Fortunately, the family remained safe and she is thankful, even though she still faces many challenges. Today, more than a month after the first earthquake, she finds it hard to return to work as she is worried about leaving her kids alone, and fears for their safety should another earthquake strike. She said that resources are hard to come by and that for now, she is feeding her kids with the food supplies that she received from the government and other humanitarian organizations. On 4 June, Habitat for Humanity Nepal distributed temporary shelter kits in Savitri’s community in Bhetwalthok, Paanchkhaal municipality of the Kavre district. Habitat staff and volunteers, along with local community members, helped build a temporary shelter for her. Now, Savitri has one less worry off her mind; her children will not have to stay in a damaged house, and she is hopeful that she can get back to work. Savitri still has a lot of challenges to face but the assistance that she got from the community and from Habitat has only made her even more empathetic to her neighbors’ plight. “Although I’m a single mother with who has to feed five mouths by myself, I know that this disaster has hit others hard, too. They might have a partner or a friend to go through this disaster with them, unlike me, but the situation is no less difficult for them as it is for me.” She hopes that other families will find the help that they badly need in the aftermath of the earthquake. Make a donation to support Habitat for Humanity New Zealand’s disaster response programme, in Nepal.